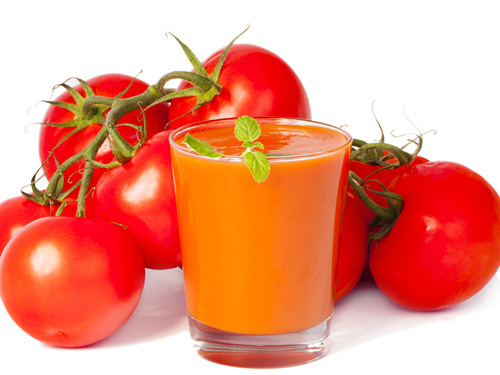 Tomato smoothie, a low calorie and highly nutritious tomato drink, is every health conscious food lover’s dream come true recipe. It is a variation of fresh tomato juice with ice and best enjoyed during hot summer. This smoothie not only refreshed you but also helps you take nutrition without adding up on calories. Cut tomatoes into quarters and keep them in freezer for 20 minutes. Take frozen tomatoes, tomato juice, chopped celery, chopped carrot, black pepper and salt in a blender. Blend until smooth puree. Squeeze out lemon juice over it and add ice cubes. Blend it again on high speed for 30 seconds until smooth texture. 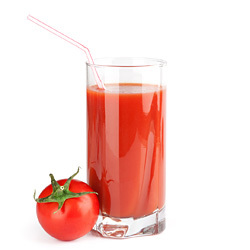 Tangy tomato smoothie is ready, pour it in chilled serving glasses and serve. Adjust salt and pepper as per your taste and liking. Sprinkle a pinch of dried onion powder or dried garlic powder for wonderful aftertaste. Taste: Tangy taste of tomato with flavor neutral celery and aftertaste of ground black pepper. Serving Ideas: This beverage is a best option to drink while you are on diet. It can be also served as afternoon summer drink. Treat your friend and family with this absolute delight in your weekend parties and freshen up the environment. It is a great site. I have been always enjoying this tomato juice and smoothie. I hope I like this...I've been looking for a summer blend to use tomato juice with for a healthy, weight loss beverage. We'll see if it is as good as it looks.